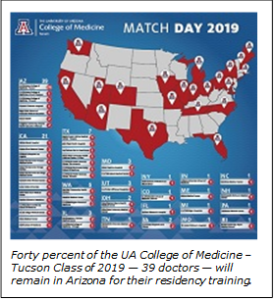 Forty percent of the UA College of Medicine – Tucson Class of 2019 will remain in Arizona to practice medicine and pursue their residency training. More than one-third of the class will pursue primary care — a physician specialty that is critically low in Arizona and the nation. On Friday, March 15, 97 medical students at the University of Arizona College of Medicine – Tucson learned where they will first practice as doctors and complete the next phase of their medical training. Forty percent of the class — or 39 doctors — will remain in Arizona. 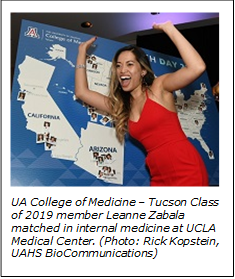 Of the 39 staying in Arizona, 27 will remain in Tucson to practice and train at the UA College of Medicine – Tucson, serving the community where they first started on the path to becoming medical doctors. The Class of 2019 applied to residency programs throughout the country. Matches included prestigious institutions such as Johns Hopkins Hospital; Stanford University; Vanderbilt University; the University of California, San Francisco; Northwestern University; the University of Colorado; the University of Washington; the University of Michigan and Dartmouth College. Interim Dean Irving Kron, MD, was proud to see so many physicians staying in the state to train, as well as so many women — seven — pursuing a surgical specialty, a field where men significantly outnumber women. According to data from the Association of American Medical Colleges (AAMC), 75 percent of Arizona medical school graduates who pursue a residency in Arizona will stay in the state to practice. With 39 UA College of Medicine – Tucson students remaining in Arizona to train, that’s good news for a state critically short of physicians. Thirty-nine graduates will complete their residencies in Arizona. 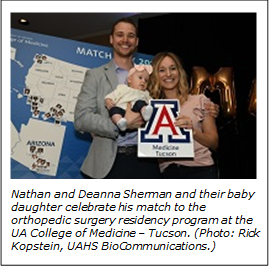 Twenty-seven students matched with UA College of Medicine – Tucson residency programs. 26 will train at Banner – University Medical Center Tucson through the UA College of Medicine Graduate Medical Education Program. 1 will train at Banner – University Medical Center South through the UA College of Medicine South Campus. Thirty-eight medical students matched into residencies in primary care fields.